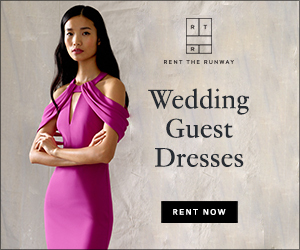 Honey Bee Wedding has a $25 gift certificate for you! Sponsored by My Wedding Favors, all you need to do is leave a comment below with the name of your favorite favor by My Wedding Favors. Want to enter again? And again? Leave a comment on our Twitter and Facebook account. While I wouldn't give these away as favors, I did put one of each of these mints in my bathroom baskets. They are cute, aren't they? I adore mint julep cups so these little candles are perfect for a romantic wedding. 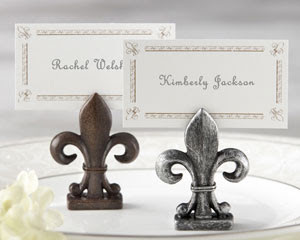 We came this close to using the Fleur de Lis on our invitations. If we had, we would have incorporated the symbol elsewhere. What is better than place cards to add flair to the place setting? The contest ends on November 16th and the winner will be announced on November 17th. 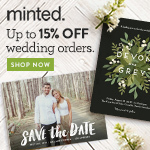 My favorite favor from my wedding favors are the "mint to be tins". I find these types of favors are the most practical and something everyone can enjoy!! I love the sweet companions brownie pops - they would be adorable on our dessert table! I think the Chirp! Chirp!" Memo Clip/Place Card Holder are quite cute. My Favorite favor is the "mint to be tins" they are so cute I just adore them! 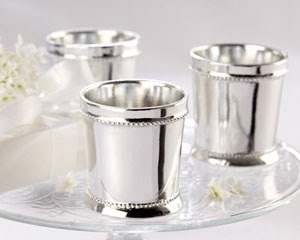 My favorite favors are the "Miniature Silver Plated Champagne Buckets." It will be such a modern twist on the traditional Greek koufeta that will sit at each guest's place setting! My favorite are the mint tins! Adorable! I love the hot off the grill tealights. so cute! Rachel, you are the winner! Please email me so that I can give you your gift certificate.